When Monty takes those long lanky steps toward the stage, you soon discover that story-teller is very different. He takes your audience through a varied routine pushing them toward disbelief, shock, and appreciation for his comedic talents....all the while they are laughing hysterically at his stories. Monty can take stories ranging from a funeral visit, to a fast food drive-through experience, to a police officer's traffic stop and make them stories you will never ever forget. By the time you get to the end of his show, you've heard (maybe more than you planned to) about his life, his family, his cat, and his latest trip to the low-rent strip bar. Monty has been held hostage in the corporate world for years, and the comedy stage has been calling for him to perform. So perform he has across the nation, in bars, colleges, and on-stage. 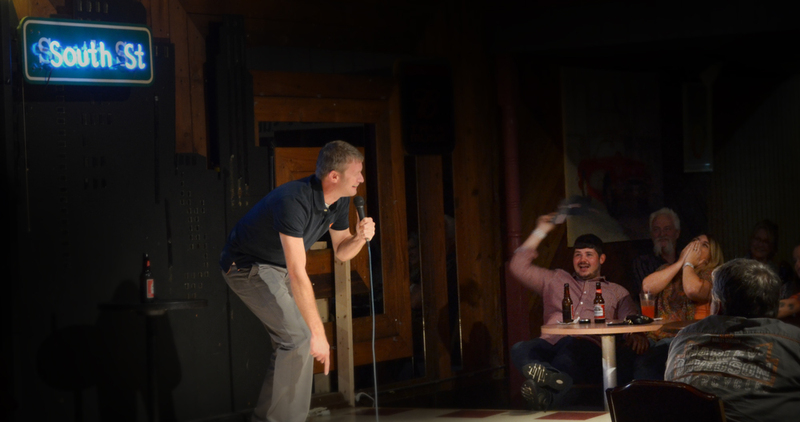 Monty's unabashed enthusiasm and comedic style turns any event (and open-minded crowd) into a great night of comedy.